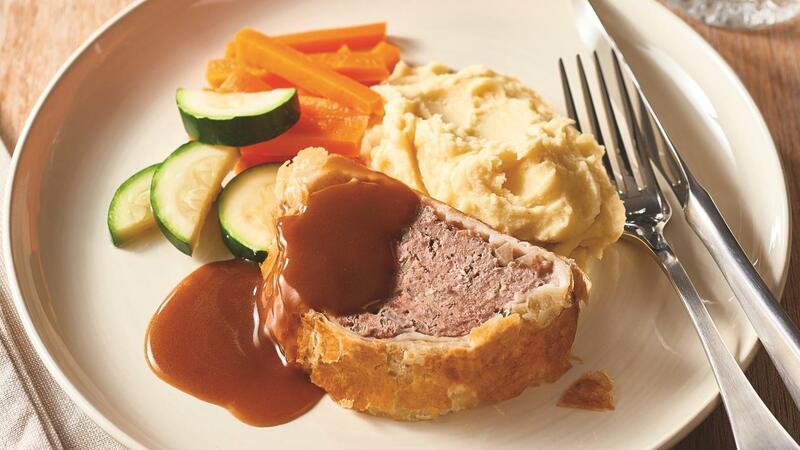 This dish is a combination of meatloaf and traditional beef wellington to give a new twist to the popular classics. Combine the lamb and sausage mince together with onions and KNORR Garlic Puree. Form into a large sausage. Lay the pastry flat, place meat into the centre and wrap the pastry around so it resembles a large sausage roll. Place in the oven at 160C and bake for 45 minutes or until cooked in the centre. Heat water in a large pot and add CONTINENTAL Rich Brown Gravy, whisk until it thickens. Add COLMAN’S Wholegrain Mustard and set aside for use. Serve with an extra pinch of Colman’s Wholegrain Mustard, steamed carrots and zucchini. Tip – This recipe can be adapted to make individual Lamb Wellingtons also.